In the longterm programme you step into the medicine lodge and you learn in the circle of like-minded people. The teachings of the longterm programme comprise three realities: the universal reality, the dreaming reality and the unending reality. They are essential as ancient wisdom for the elder wisdom keepers of the earth. These authentic teachings are passed on through intensive ancient rituals and ceremonies to develop your full capacity of awareness, perception and dreaming. These teachings follow the ancient mastership of awareness, spiritual transformation, manifestation and materilisation. The rituals teach high states of perception and out of body experiences that are essential to stop the material world and move through the dreaming reality which is the bridge to the unending reality. This leads to the ancient way of being in a state of “no mind” and achieving the state of “one mind”. The rituals start by a kind of training that is built up by holding different states of perception. They relate to things that are close to you like the spirits of animals, plants and natural items. You can instantly apply these rituals to your everyday life. In the longterm programme we meet three times a year for four days over a period of three years. Participation is only possible by invitation. The gained knowledge will be practically applied at power places in nature at Königssee. You experience direct communication with totems, ancestors, light beings and you learn how to master the material reality by becoming familiar with unending realities. He is a master of indigenous tribal ceremonies and a keeper of over 400 traditional, paleolithic rituals. A few years ago he decided to teach the white man. It is important for him that people are genuinely interested in the profound wisdoms of tribal rituals. You learn techniques and have your own experiences. As a teacher this independance is extremely important to him. People who work with Chief Dancing Thunder value his great ability to explain complicated matters in an easy way. His humour brings lightness. During the rituals Chief Dancing Thunder specifically uses the art of overtone drumming. A unique method to calm down the permanently intervening mind. There are up to four drummers in the rituals. 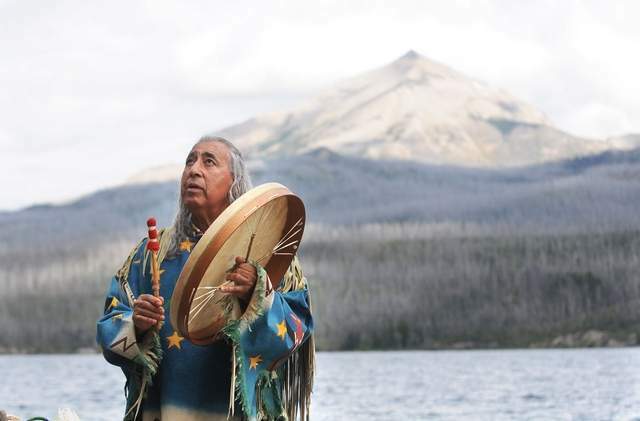 Because of the big interest in the deep meaning of ancient rituals, indigenous healing arts, immense wisdom of the native peoples of North America and their spiritual connection with personal things, this education was created. These teachings derive from ancient traditions and furthermore comprise rituals from Chief Dancing Thunder’s family tradition - unique rituals, that only exist like this once in a lifetime!